We are raising funds to provide travel fellowships for African students to attend the ISCB Africa ASBCB 2019 Conference on Bioinformatics. 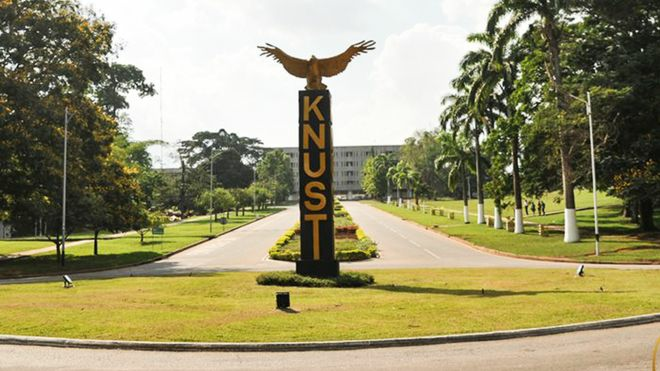 Kwame Nkrumah University of Science and Technology, KNUST is located at Kumasi, the heart of Ghana that is popularly known as the Garden City. The conference will be hosted at Amonoo-Neizer Conference Center also known as Institute of Distance Learning Conference Center. Just about 100 meters away from the Conference, is a Olympic size open swimming pool on KNUST campus. From Accra to Kumasi transport by bus, it costs between USD 8.00 to USD10.00 with respect to mini buses, big and small Yutong Buses and VIP buses. One can also travel from Accra international airport to Kumasi by air, 45 minutes flight with domestic airline such as AWA or Passionair. Taxis fare from Kumasi Airport to KNUST Campus is about $6:00 - $8:00. For persons within and around the Kumasi Metropolis, the first access point to KNUST is Tech. Junction, a major station just outside the main gate of the University. From any point in and around the metropolis, one can board any vehicle, be it private or commercial to Tech Junction. Getting to and around KNUST campus, which is about 16 km2 is an easy task for all. There are free bus services. On arrival at Tech. Junction, which is a main transport terminal just outside the main gate of this prestigious University, one can locate several avenues to board a car to get to the Campus. First is by transport through any of our gates to campus in a private vehicle. Private vehicles are allowed into main KNUST campus without any restrictions. The organizers can also arrange KNUST mini bus to transport delegates from Accra to Kumasi or internal travels in Kumasi in groups of any number. Original Paper Submissions for Oral Presentation Deadline is 15 October 2019. Abstract submissions must be a maximum of 250 words (to appear in the conference booklet) and should provide an explanation of how the work of the submitted paper(s) is impacting the field. Submission must highlight work that has been published between June 2017 - August 2019. Scientific Program Committee will also consider research that have been previously presented (within the timeframe of June 2017 - August 2019). Research must contain new significant finds. Author is to provide the conference name, program listing (if available) and conference URL. This information should be entered in the publication information field during the submission process. For each presenter only one previously published research submission will be reviewed (the LAST will be taken by default). The same limitation applies for the last author (group). Publications can be grouped if it becomes clear how different publications will be combined in a talk. The maximal number of submissions per author/co-author is 5. Previously Published Research Submission Deadline is 15 October 2019. Original Abstract Submissions for Oral Presentation Deadline is 13 September 2019. Previously Published Research Submission Deadline is 13 September 2019.